I am writing this letter on the same day as the Prime Minister has sent her letter requesting a short delay to Brexit. There is still no clarity on what will happen next, when the country will leave the EU and what our future relationship will be. The continued prayers of all people of good will are needed, that wise counsel will prevail, and that whatever happens the most vulnerable are protected and the country enabled to draw together and not further apart. In the midst of uncertainty, personal and political, Easter gives us confidence on the basis of what God has already done for us. The life, death and resurrection of Jesus took place in one particular point in history, in one small, crowded country. But they didn’t just affect his own times. Jesus died for all of us, wherever and whenever we live, paying the price of sin. And he rose again for all of us, defeating death and opening the way to eternal life for all who trust in him. Because of Easter we have confidence that nothing can ultimately thwart God’s good purposes and that all in the end will be well. From the cross God’s love, healing and forgiveness is poured out on a dark and divided world. Come this Holy Week and discover (again or for the first time) that love, healing and forgiveness for yourself. From the empty tomb God’s light radiates hope into a world of cynicism and despair. Come this Easter and find (again or for the first time) that certain hope, peace and joy that we may live as people of hope. Holy Week is not only the most significant week in our Christian year, it also has the most powerful acts of worship as we seek to enter into the truth of what Jesus has done to save us. On Palm Sunday we sing Hosanna as Jesus enters Jerusalem and then prepare for what is ahead as we hear the gospel of Jesus’ passion (suffering). On each weeknight from Monday to Thursday there is a special service at 7:30pm, alternating between the two churches. 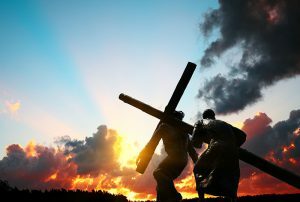 On Good Friday morning there is a family friendly service which takes us outdoors as we follow the cross to Calvary. There is a quiet and solemn service at Altham Church on Good Friday at 2pm. Come and join in worship as you can, especially on Maundy Thursday and Good Friday – I promise that Easter Day will mean all the more to you if you do. Clayton Community Centre (aka Arthur Wilson Centre) on Saturday 19th– drop in any time between 10am and 12 noon for refreshments and Easter Crafts. This is for the whole community, so please spread the word! A great opportunity to stretch those legs and spend some time together. Meet outside All Saints’ Church at 10am for an approx. 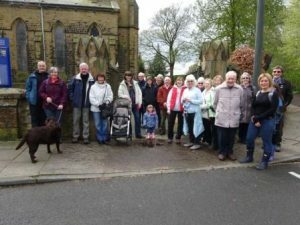 2 hour walk, ending at the Hyndburn Bridge where we will enjoy lunch – please sign up at the back of church if you’ll be eating. This is your chance to hear what your PCC has been doing over the last year, learn how the finances are going and participate in the election of churchwardens, PCC members and sidespeople. All are welcome to attend our meetings, which take place within worship, including hymns, prayers and readings. However, to speak or vote you must be on the (new) church electoral roll of the parish concerned. St James’, Altham’s meeting will be on 7thApril at 9:30am. All Saints’, Clayton’s meeting will be on 28thApril at 11am. Could you contribute by standing for election to the PCC? Each of our churches has a decision-making body called the Parochial Church Council or PCC. 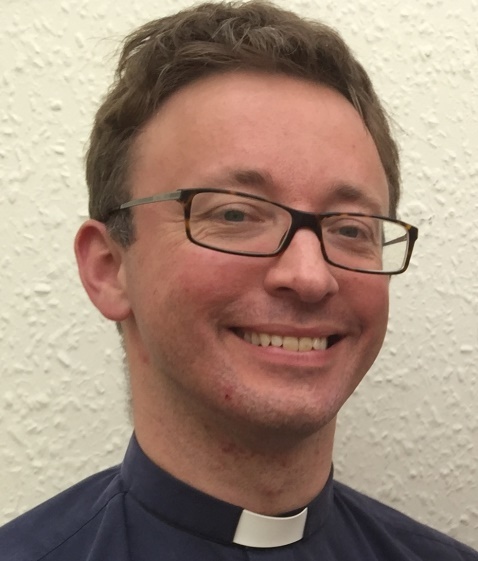 It has responsibility for the finances, for maintenance of the church building, and for co-operating with the vicar in furthering the mission of the church within the parish. Each PCC is a charity and the members are its trustees. Serving on the PCC is a great way to serve the local church, and to help to shape its future direction under God. 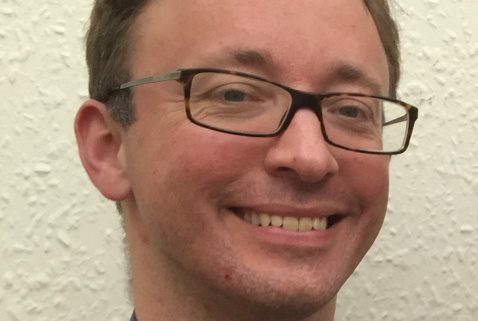 The demands aren’t too onerous – normally a meeting every two months, a planning morning once a year, and at All Saints’ service on a committee or working group. We do expect, though, that PCC members will see themselves as sharing in the leadership of the church and thus be regular in worship and active in supporting what we do. PCC members serve for 3 years, and each year 1/3 of the seats are up for election. That is five at All Saints’ and two at St James’. To be eligible you need to be at least 16, a baptised, regular communicant member of the church, not be disqualified from serving as a trustee, and have been on the church electoral roll for at least 6 months. To stand please complete one of the forms available at the back of church. The election then takes place at the Annual Parochial Church Meeting.